Rita Aleman has been named the program manager of Marquette Law School’s new Lubar Center for Public Policy Research and Civic Education. Since early 2016, Aleman has been executive producer for “Matter of Fact with Soledad O’Brien,” a Hearst Television weekly political news magazine based in Washington, D.C. Aleman was executive producer for special projects at WISN 12 television in Milwaukee from 2002 to 2016. 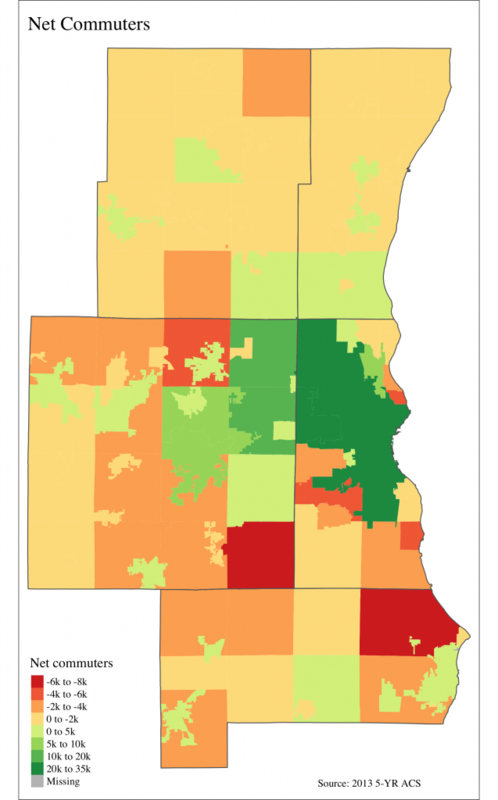 This post is part 2 of a 3-part series based on data originally presented at the first Milwaukee Area Project conference. Part 1, overviews trends in population, employment, and wages since 1990. 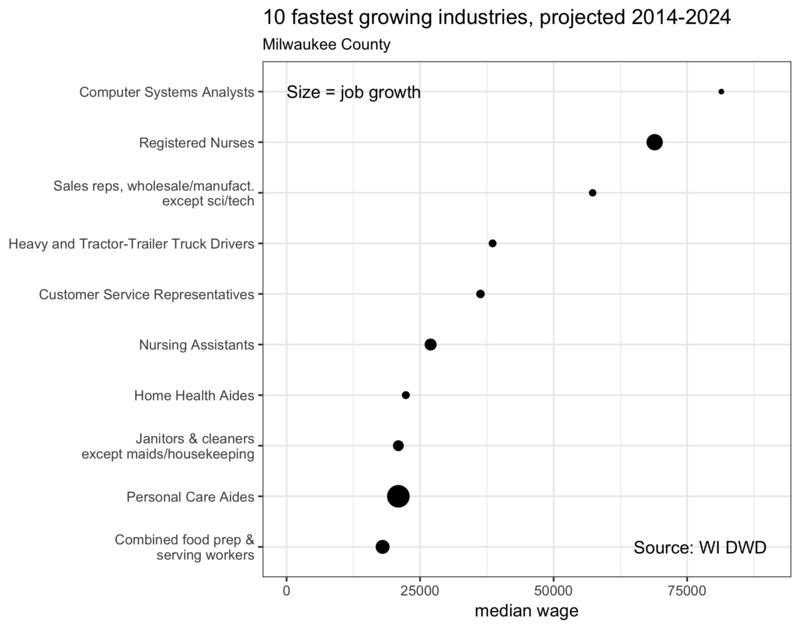 Part 3, considers the future of the Milwaukee area workforce. The map above traces commuting flows between each of the 100-plus cities, towns, and villages in the 5-county Milwaukee area. 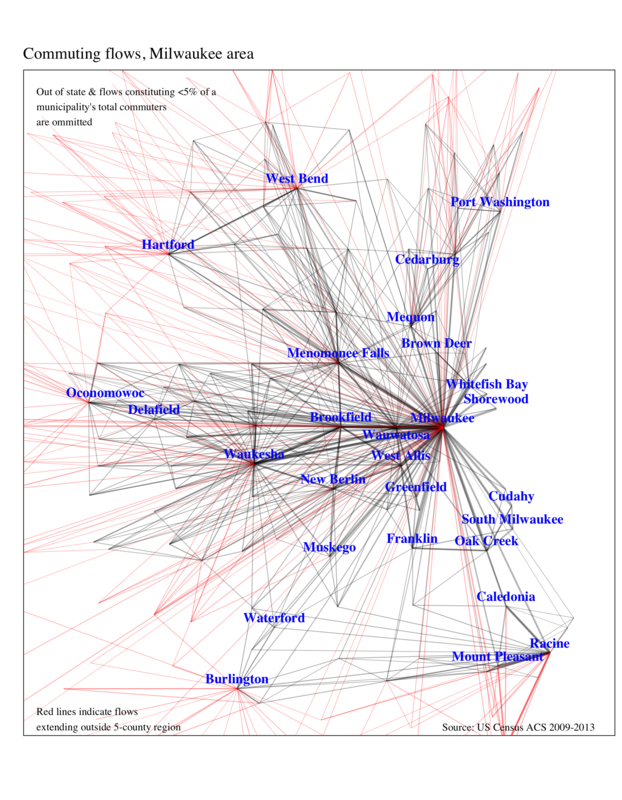 The red lines depict commuters entering or leaving communities outside the region. In the past, a traditional view of a metropolitan area would likely have been an urban core with many long, straight lines connecting it to the surrounding predominately residential suburbs. This is not the case any longer. 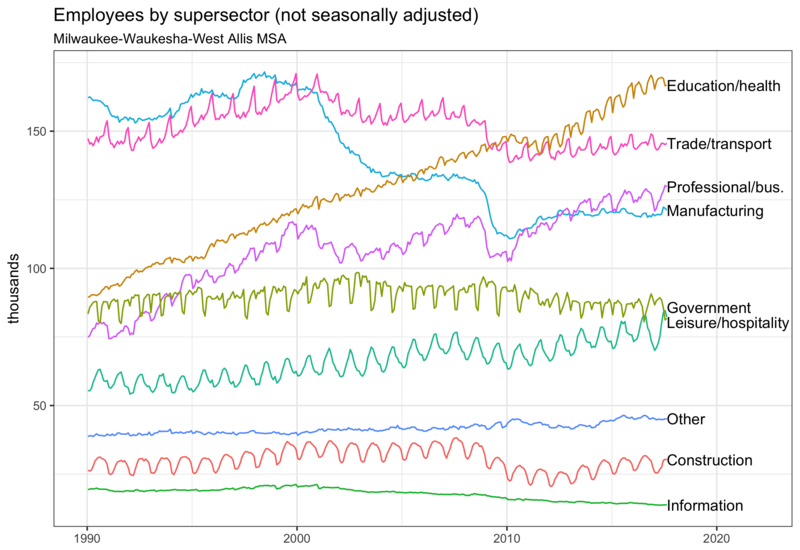 In economic terms, the dominant part of the region is now the horizontal axis running roughly west from Milwaukee, through Wauwatosa and Brookfield, and on to Waukesha. Racine county is less connected. It sends quite a few workers to Milwaukee and Waukesha county, but comparatively few workers travel the other way. Racine is also substantially connected to its neighboring counties of Walworth and Kenosha. While the above map includes commuting flows in both directions, the one below shows net commuters. Green municipalities have larger populations during the day than at night. Milwaukee city attracts the most workers—some 125,000 in total. Still, nearly 95,000 people leave the city for work every day. Thirty-thousand of them go to Waukesha county, while 30,000 in Waukesha commute to the city of Milwaukee. 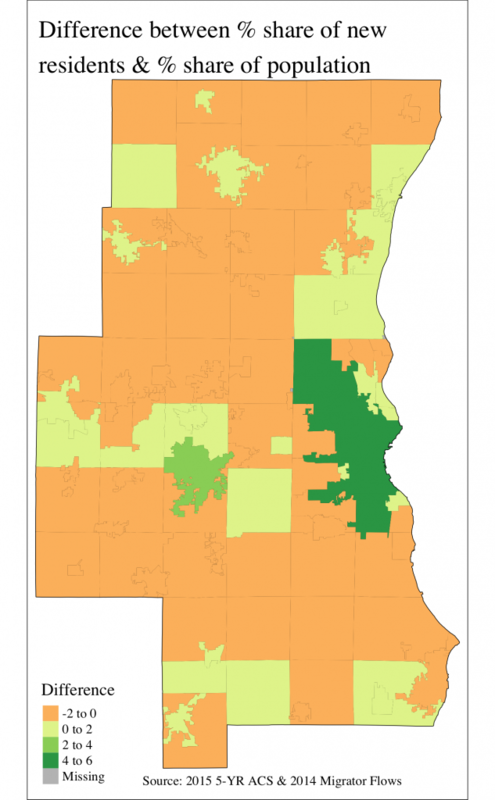 The net-worker balance between Milwaukee city and Waukesha county is virtually equal. 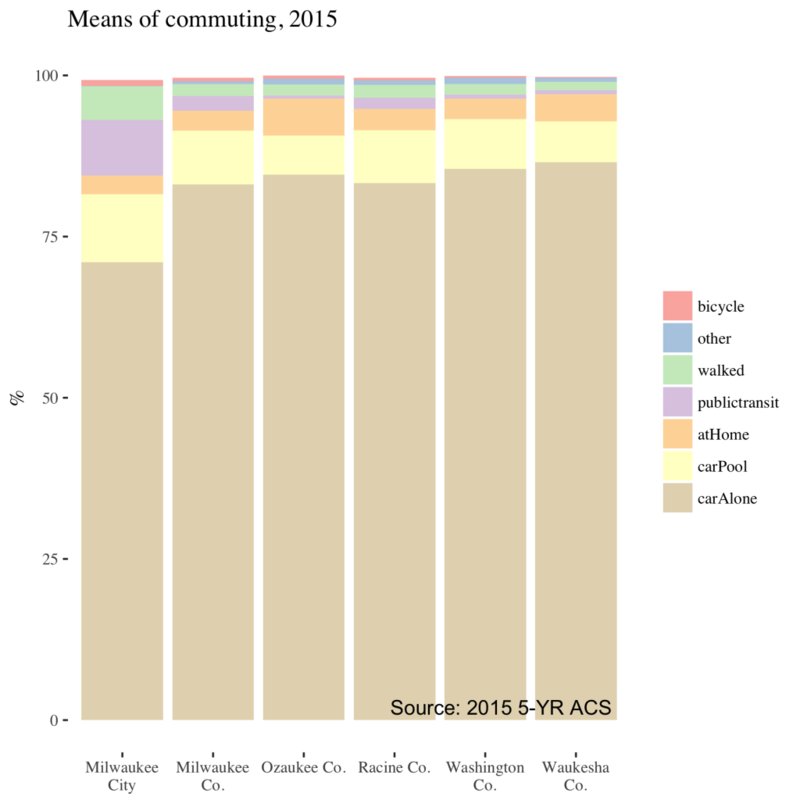 Most people in the Milwaukee area get to work the same way—by driving 20-25 minutes in a car, alone. Regionally 8% carpool, 4% use public transportation, and 3% walk. Differences between the counties are small, as the graph below shows. Milwaukee city workers are the least likely to drive alone. Eleven percent carpool, 9% take public transit, and 5% walk. Working at home is rare everywhere, but it is most common in wealthy Ozaukee county where 6% of workers do so. Half that many do so in the City of Milwaukee. Knowing that the great majority of commuters travel alone by car gives added significance to traffic data. Below we have plotted counts from a Wisconsin Department of Transportation traffic monitor on I-94 just west of 37th Street in Milwaukee. 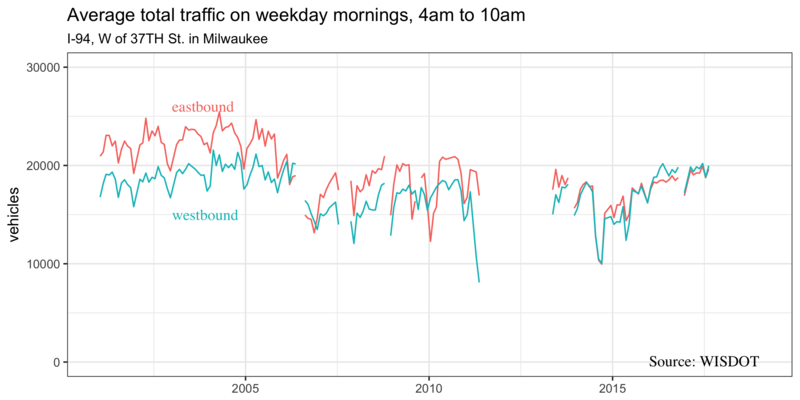 The graph contains all traffic from 4:00 to 10:00 on weekday mornings. Of course, this is not the same as commuting. It includes people driving for other reasons, many people work during other times of the day, and I-94 is just one of the ways people travel to work. Still, the traffic monitor’s location is part of the major east-west commuting axis visible on the commuting flow map discussed above, so we expect traffic trends to reflect commuting patterns to a considerable degree. Sure enough, while eastbound flows outnumbered westbound flows during the early 2000s, the recovery from the Great Recession has seen the two converge at around 20,000 in each direction every weekday morning. This is consistent with the 30,000 commuters between Waukesha county and Milwaukee estimated by the Census Bureau. Though it has declined in recent years, moving for work is a common cause of migration. Given this, it’s not a surprise that the map of municipal population growth below share similarities with the map of net commuters. Places where people travel to work are also frequently (but not always) places where people want to live. Racine city is a notable exception. Leaving aside the City of Milwaukee, growth has slowed from the 1990s. The Milwaukee area’s growth is also low in comparison to more dynamic areas of the state like Dane county. 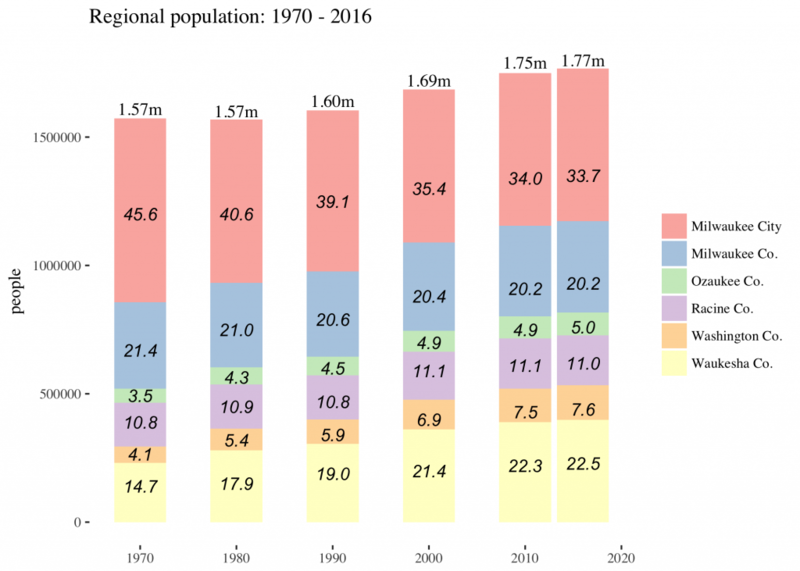 One reason for slow growth is the region’s subpar record in drawing new residents from outside the area. The chart below shows net domestic migration as a percent of total population for each metropolitan statistical area in the United States. Both MSAs in the 5-county area lost more people to domestic migration than they gained. To be clear, this doesn’t include people who entered or left the country. When people do move to the 5-county area from elsewhere, they are most likely to move to one of our two major cities—Milwaukee or Waukesha. Thirty-four percent of the region’s population lives in the city of Milwaukee, but the city attracts 39% of new movers. Waukesha’s share of newcomers is also disproportionately large. This attractiveness to migrants is likely connected to Milwaukee’s recent growth in total establishments. Population growth and business growth operate in a positive feedback loop, so the attractiveness of Milwaukee to certain kinds of migrants is both a cause and an effect of the economic boom taking place in some parts of the city. 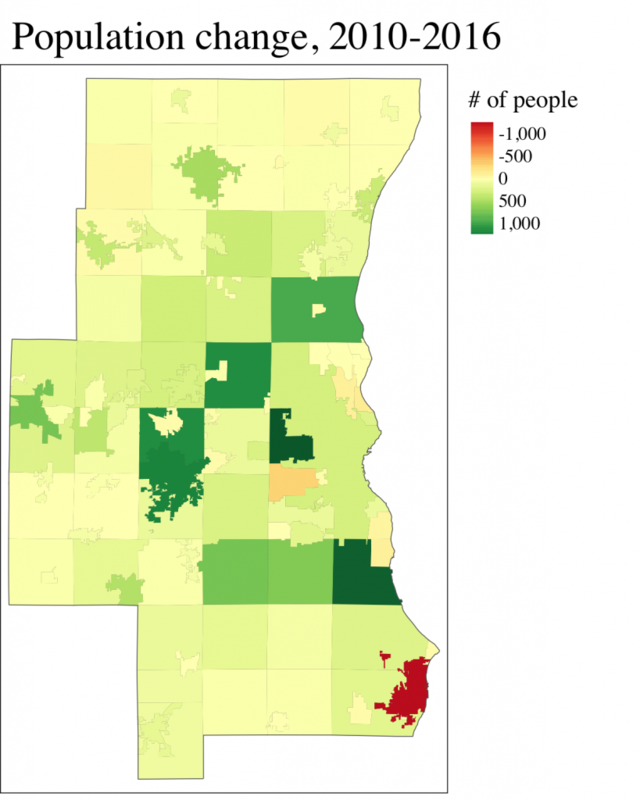 This post is part 1 of a 3-part series based on data originally presented at the first Milwaukee Area Project conference. Part 2 focuses on commuting and migration. 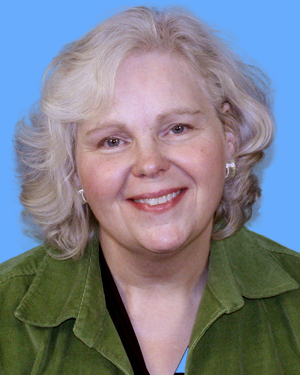 Part 3, considers the future of the Milwaukee area workforce. Over the past few decades, the Milwaukee area has evolved from a traditional central city and suburban dichotomy to a more evenly balanced multi-polar region. In 1970, about 46% of the entire five-county region lived within Milwaukee City limits and two-thirds lived within Milwaukee county. Today, the county’s share of the population has fallen to 54%. 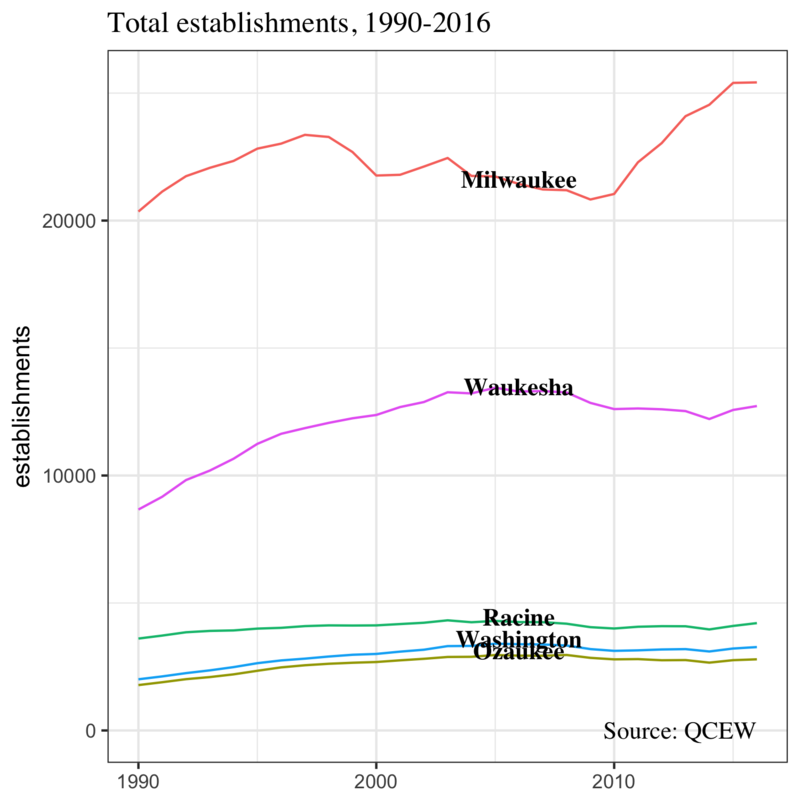 Milwaukee City is still more populous than any “suburban” county, but Waukesha, Washington, and Ozaukee have all grown significantly. 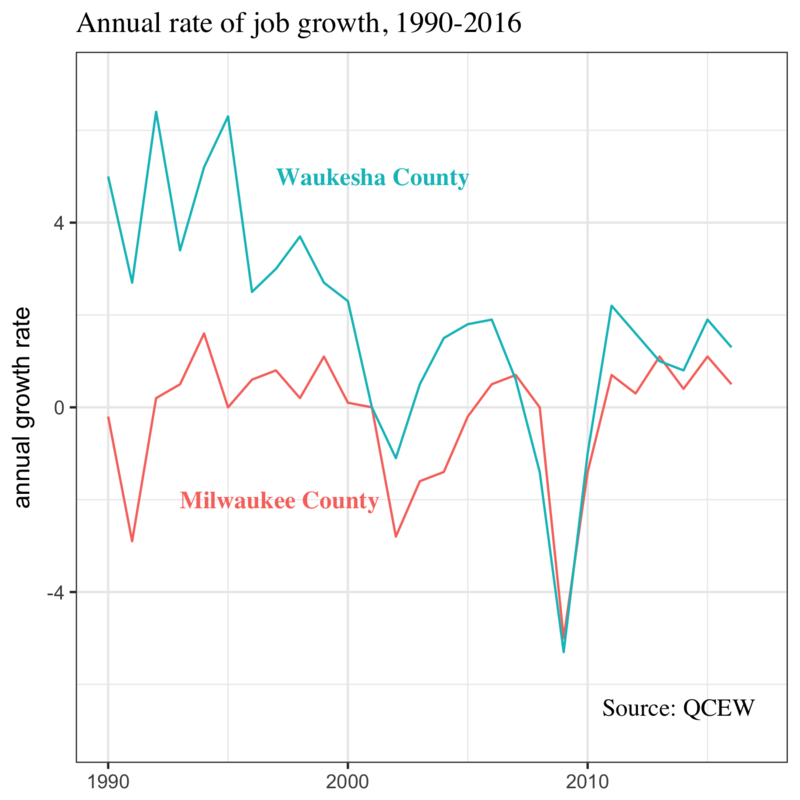 The most robust recent gains have occurred in Waukesha and Washington counties, both of which enjoyed double-digit growth rates from 2000 to 2016. Washington county added 17,800 new residents and Waukesha 37,700. Over the same period the city of Milwaukee lost about 1,900 people—although this 0.3% decline represents a major improvement over the previous decade, which saw the city drop by more than 31,000 residents. Among incorporated municipalities, Waukesha city gained the most (7,500), with Oak Creek just behind (7,400). The largest losses came in Racine (4,300), followed by Milwaukee and West Allis (1,200). Total employees over the years tells a similar story. (This refers to total jobs in the county, regardless of where the workers live). In 2016, the 5-county region hosted 895,000 jobs. Fifty-four percent of these positions were located in Milwaukee county, while 27% were in Waukesha. During the 1990s Waukesha county added jobs at a robust average pace of 4.1% a year. Milwaukee county’s growth was much more anemic— an average of just of 0.2% annually. Likewise, the national economic downturn in the early 2000s affected the two counties in very different ways. 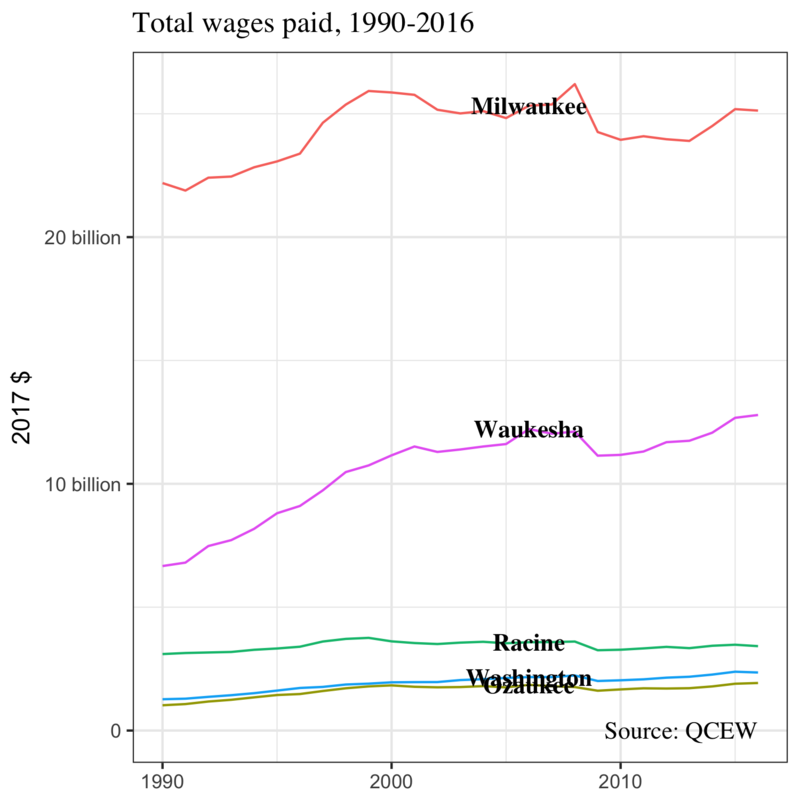 From 2000 to 2007 Waukesha’s job growth merely slowed to an annual pace of 0.9%, while Milwaukee’s labor force contracted—declining an average of 0.6% each year. These differences between the two counties have been less apparent since the Great Recession. Both counties fell hard. 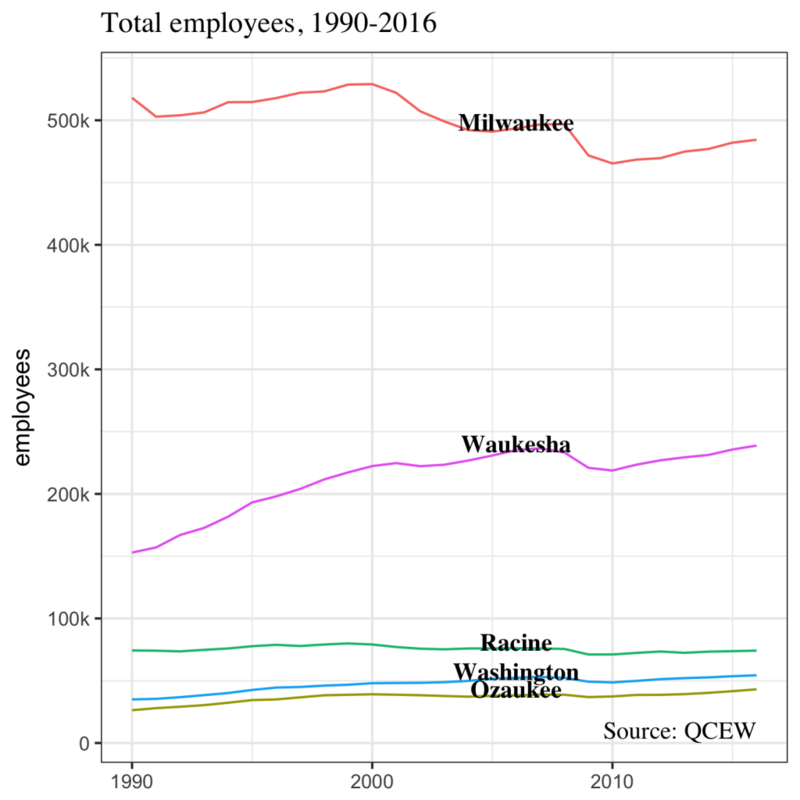 Milwaukee lost 6.3% of its workforce from 2007 to 2010, and Waukesha lost 7.5%. Since then, they have recovered in a similar fashion. 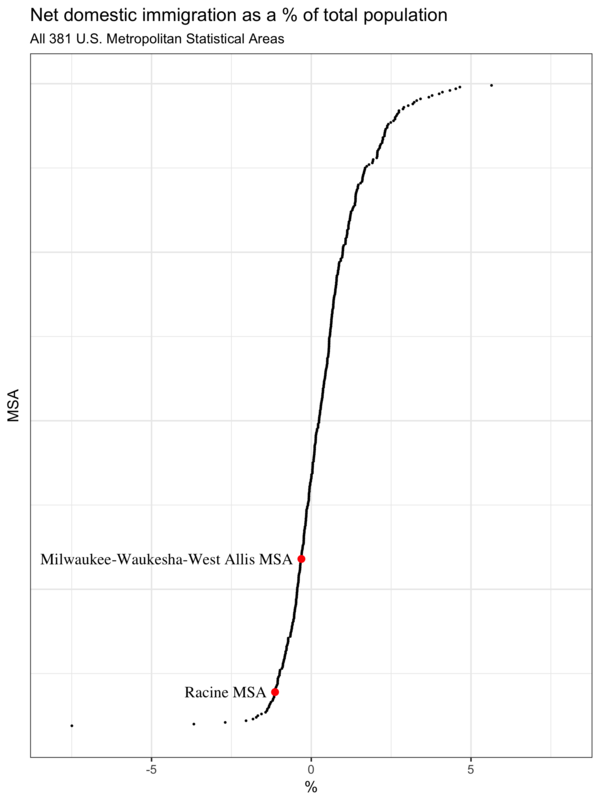 During the 2010s Waukesha’s average annual growth rate has been 1.1% and Milwaukee’s has been 0.4%. In raw terms Milwaukee added 19,000 jobs from 2010 to 2016; Waukesha added 20,000. The Milwaukee Area’s smaller counties have also recovered steadily from the Great Recession. 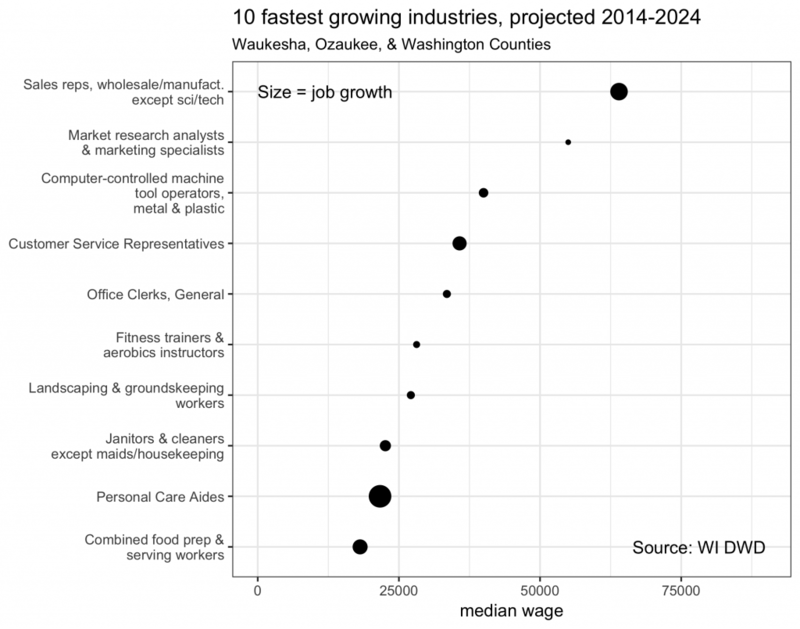 Since 2010 Racine has averaged 0.6% annual job growth, Washington 1.4%, and Ozaukee 2.3%. Workers in the entire five-county Milwaukee Area earned about $45.6 billion in 2016. Milwaukee county earners brought home 55% of this. Waukesha employee’s earned 28% of the total. Racine, Ozaukee, and Washington counties combine for the remaining 17%. These broad measures of population, employment, and wages all tell a consistent story. For the past quarter century the Milwaukee Area has grown increasingly decentralized. Washington and Ozaukee have expanded their population, but the major growth has occurred in Waukesha county. Still, several signs suggest that Milwaukee has turned the corner on some of its long-running economic struggles. 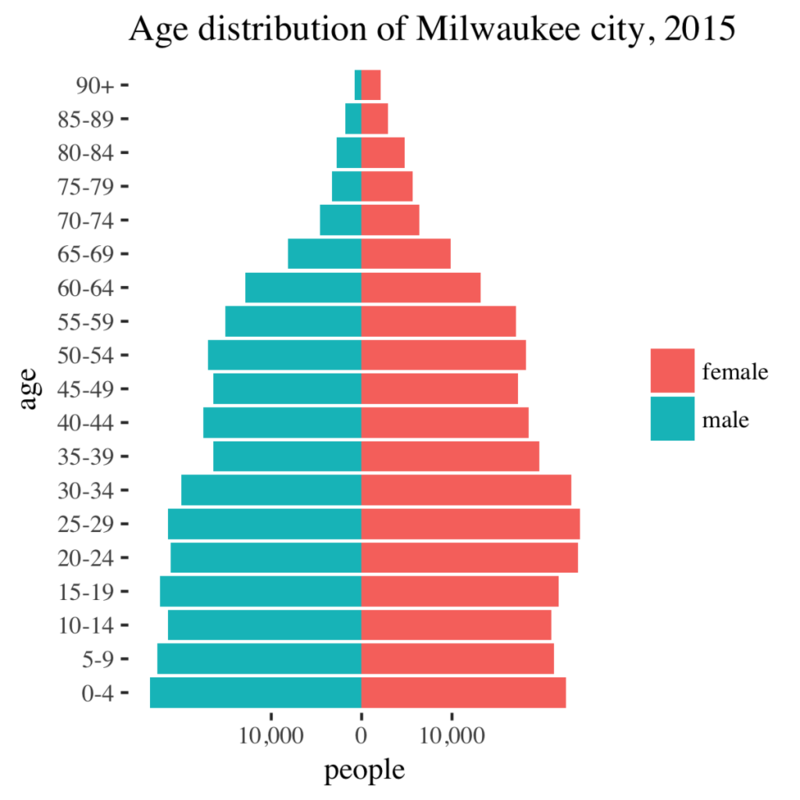 The steep population loss of the 1990s has subsided, and Milwaukee City’s population now seems to be holding steady at just below 600,000. In comparison to the early and mid-2000s, the region’s recovery from the Great Recession has been fairly equal across Milwaukee and Waukesha counties. Some of the strongest evidence for Milwaukee’s ongoing revival is in the graph below. According to the Quarterly Census of Employment and Wages, Milwaukee county added 4,377 establishments in net terms from 2010 to 2016. During the same time period, the remaining four counties combined for just 481 additional establishments. Milwaukee county alone still holds over half the region’s people, employs over half the region’s workers, and generates over half the region’s wealth.